PBOT wants to crack down on sidewalk riding this time around. Portland’s second attempt at integrating electric scooters into the mobility mix could get started as early as April 26th. 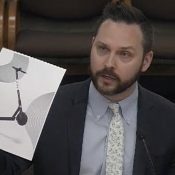 And unlike the 2,000 scooters we had on the streets last year, the Portland Bureau of Transportation will start with 2,500 and estimates we could see as many as 9,000 if enough scooter companies play ball with a host of new regulations. 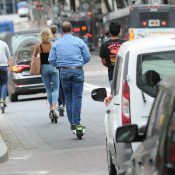 PBOT says if all permits are granted and all operators qualify for incentives we could have 15,000 scooters in use by January 2020. The new pilot is scheduled to last one year, after which PBOT says they’ll work with the public to develop a permanent program. In their announcement today, PBOT released a mix of incentives and regulations that demonstrate the challenge they face to create a scooter program that leads to high ridership yet also addresses serious concerns raised by some people and organizations during the first pilot. At nearly 6,000 trips per day during the 120-day pilot last year, the scooters proved to be a valuable mobility option. However, due to a lack of safe space to ride them and a lack of consideration for others, too many people rode them on sidewalks and parked them in places that obstructed public right-of-way. Earlier this month PBOT was sent a letter and threatened with legal action by Disability Rights Oregon over concerns about scooters being parked on sidewalks. In response, PBOT has developed a system of carrots and sticks that puts the onus on riders and scooter operators to fix that problem. The more a company does to prevent riders from riding and parking on sidewalks, the more scooters they’ll be allowed to release (and the more money they can make). 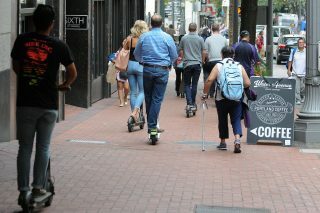 PBOT is offering a 20 percent increase in the size of a company’s fleet if they, “implement innovative technology or business practices that eliminate sidewalk riding.” PBOT will also award more points to a company’s permit application if they offer scooters that can be locked to public bike racks (instead of sidewalks or ADA ramps). When it comes to accessibility, PBOT will allow operators to introduce scooters with seats. As for riders who flout traffic laws, PBOT will make operators responsible for issuing warnings and fines to account holders who aren’t riding legally. In today’s announcement, PBOT said they’ll employ “regulatory specialists” who will monitor sidewalks and illegal riding and then forward that information onto operators. After a warning, a rider could get a fine of $50 for sidewalk riding or $15 for illegal parking. Another area of concern last time around was the use of scooters in Portland Parks properties like the Eastbank Esplande and Waterfront Park. It was technically illegal (no motorized vehicles allowed in parks), but many people did it anyways. To limit access to these areas, PBOT says they will require companies to use “geofencing” technology that prevents riders from ending a trip and parking in Waterfront Park. To encourage availability in east Portland, companies will be allowed to increase the number of scooters in their fleet by 35 percent if they meet or exceed 2-3 trips per scooter per day. 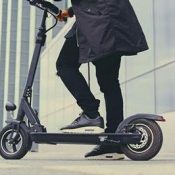 A minimum of 15 percent of a company’s total scooter fleet must be deployed east of I-205 (that’s down from a 20 percent minimum last pilot). Permit applications are due April 9th and PBOT will notify finalists April 18th. This is in parentheses, but this should be the headline. NO ONE RIDES ON THE SIDEWALK JUST TO BE ANNOYING – IT’S BECAUSE THERE’S NOWHERE ELSE (SAFE) TO RIDE. Full stop. This isn’t about race. It’s about a lack of infrastructure. Build protected scooter/bike lanes—and protected intersections—and magically, people won’t ride on the sidewalk anymore. Totally. I’ve seen them being used on the sidewalk on Hawthorne where there’s zero room for scooters but most people aren’t going to feel comfortable taking a lane. Folks want to use these in shopping districts. The real shame is that it should be a safe street to use them on but no one seems to care about the 20 mph speed limit. It should be a safe street to ride scooters on, but the 20 MPH speed limit has nothing to do with it. Even if every car drove 20 MPH, most people would still ride on the sidewalk—it’s simply too scary riding next to cars for MOST people (despite a lower fatality rate, a car can still kill you at 20 MPH!). Hawthorne needs *PROTECTED LANES* for people on bikes and scooters. If only businesses knew that world-class bike lanes are proven to increase business. They’d be built overnight. The city won’t actually build anything with the “safe streets” fee they will collect. It will all go towards paying planners and stuff. This city cannot be trusted to build quality cycling infrastructure. Just look at the W Burnside / 18th / 19th project: it started all all curb protected with sidewalk extensions on Alder, and ended with just paint with maybe one curb thrown in for good measure. No one on Bike Portland seems to be tracking this, but the trend of starting with a quality project on paper and ending with noting more than just paint is troubling. Why waste money on the initial plans anyway? There really needs to be a non-PPB (and unarmed ffs) entity to manage enforcement of the scooters. Just tell them to issue tickets to everyone they see riding on the sidewalk, like what TriMet does with MAX fare violators. As stated in the article the emphasis on enforcement seems to go against recommendations made elsewhere. It wouldn’t be as big a deal if drivers were held to a standard approaching what is proposed in this second “pilot” however that is not the case. This seems to be a case where a defensible decision is being made while focused in tightly on a specific problem (or set of problems) without zooming out at all to take the broader context into account. This certainly is a victory for disability rights advocates as scooters and wheelchairs mix very poorly. Underlying that is the unstated issue that cars make it unsafe enough that everyone is seeking refuge. Until we deal with that it’s pitting environmentally “good” options against themselves while motordom is allowed to continue its reign largely unimpeded. Also City Council needs to update their ordinance regarding e-bikes and scooters in Parks. It doesn’t really serve a public good as the rule prevents safe and efficient mobility (compared to driving). I was thinking the same thing… A 50$ fine for riding on the sidewalk would/could be worth the cost vs. an emergency room visit made necessary by an oblivious driver/ill-maintained street surface. And then re race… I see these things as more a hipster device/toy & as such more likely ridden/used(?) by white people… tho I’ve not paid them much attention. More often than not in Portland. Did you hear about the hipster who burned his tongue? He drank his coffee before it was cool. It always shocks me when people think a subgroup that matches the racial demographics of Portland as a whole is somehow a massive injustice. Statistically yeah, Portland is pretty white but it’s also far more segregated than most cities and that leads to the perception that this city is whiter than it actually is. Remember that every time you say “Portland is white” you’re pretending that about 25% of the population doesn’t exist. “You’re pretending”… I am not pretending anything. Portland doesn’t rank in the top ten segregated cities in America. I grew up in Boston which is still on that list, but you wouldn’t walk down most streets there today and conclude, “Boston is predominantly white.” When I moved to Oregon I was dating a beautiful Haitian woman and we painfully chose to part ways because she was not comfortable in Portland, which is a city you can indeed walk away with the impression it’s predominantly white. (She lives in Denver now). I currently live in a city in California that you might also conclude is predominantly white, but the census shows otherwise. More often than not any group in Portland is predominately white. Every non-white person that’s ever rode an e-scooter now thinks you’re racist. That would be tragic if MOTRG and Flareon and I can’t discuss or debate openly about race without being labeled “racist.” I’d hate for the world to become so myopic we can’t learn from each other without inference of ill intent. Plus I’m not sure I believe that you’re the spokesperson for that minority subgroup of said transportation mode. I think you mean “non-white hipster”. That’s what MOTRG was responding to, if I can be so presumptuous. Now if I were a non-hipster who used e-scooters, I might be highly offended by this hipist exchange. One wonders how an enforcement person will chase down someone riding on the sidewalk? Will the scooter cops ride scooters too? On the sidewalks to catch the violators? I’d bet that maybe ten people are ever actually sanctioned, because there is no way to actually do it. I read awhile back that some of these scooter companies offered to pay for new bicycle infrastructure in some cities in exchange for the right to operate. We should cash in on that offer. Maybe we can get Carl’s Jr. to sponsor something. Since e-scooters aren’t allowed on the multi-use path in Waterfront Park, if you want to ride over the river, say at the Steel Bridge, wouldn’t that make the proper place to ride the scooter on the upper deck of the bridge? Are motor vehicle users going to respect the presence of scooters there? I used to ride the upper deck on my bicycle daily and I ended up just taking the full lane out of the Rose Quarter going east to west all the way across the bridge because 1 in 10 drivers was terrible about safe passing distance around the right hand curve approaching the top of the bridge. If scooters are forced to the roadway in everywhere the scooters want to go it will be interesting to see patience drivers are going to have while navigating around the scooters. I don’t have much faith that they are going to be any better than they are around bicyclists. I expect miniscule enforcement of 15,000 scooters. As a band-aid, there needs to be per-trip medical and injury liability insurance. I already have medical insurance, and I carry 500k coverage on my auto policy, along with a million dollar umbrella policy. I don’t particularly feel like I need to be charged for additional coverage on top of that when riding a scooter. Its seems like you afford it though. It actually doesn’t cost that much to add an umbrella policy to your policy, but you do have to increase your coverage to 500k to do it. I recommend everyone consider it, I did it solely because I fear being hit by the 1 in 8 Oregon drivers who choose to drive around with no insurance at all, but I certainly don’t wish to be forced to buy even more insurance just because I am riding a scooter. Nor does the data from the pilot seem to back that up as being a good policy. Well we’ve pretty much already lost the MUP’s. Platinum cycling in Portland, Yay! So, we’re going into this again with the idea that scooters should NOT be in Waterfront Park or the Esplanade? I’ve never tried a scooter and don’t really plan to, but if they don’t want you using Waterfront Park I have no idea what the point is of allowing the scooters at all. It’s the safest area to operate the scooters and it’s a mixed use path so people are already okay with the logic that some people operating in that space much travel much faster than others. Also, the folks at PBOT, City Council and regular Oregonians seems to treat this scooter program as a novelty for tourists / recreational riding (hence the completely misplaced regulation regarding mandating helmets) and Waterfront Park is the absolute perfect place for all that. I’ve never felt the need to use a scooter because the sort of short trips (e.g. heading to a lunchtime appointment in NW from downtown) that might have made scooters an interesting option can be more easily/legally handled with either my own bike or biketown. And while I understand that less “strong and fearless” riders (or people who may not have ridden a bike in decades) may not feel comfortable just jumping on a bike share (relatedly, we should have much better bike infrastructure in the central city,) if you bar use of the scooters on the sidewalk, I don’t see why scooter use is an attractive transportation option at all. This! I’ll never use them, but as someone way back said, scooters on the streets look like 2000 deer are running loose downtown. Everyone slows down, they look for others, and they drive with a vision zero mindset. More scooters on the streets make every vulnerable user safer, because average speeds will go down. I feel far less safe on my bike around the scooters, to the point where I actually rode less last summer when the pilot program was in place. You’re wrong for feeling that way. Stop making excuses. My wife will use her e-bike for short trips with me, but refuses to even try an e-scooter. They’re not safe enough for her. Bikes are barely safe enough for her. She just doesn’t trust an inline skate with a handle (e.g. e-scooter) to safely navigate our poor pavement conditions. Scooter Tuesday: Every Tuesday we all ride scooters & we take the lane everywhere we go. Be a total nuisance. Zoobomb on Scooters. Fill the streetcars with Scooters. Fill the Pearl with Scooters. Heck, make every day Scooter Day. Oh boy. Well it’s been a nice quiet winter at least. These fees are too high, the companies will not be able to profit at $80 per scooter and instead we simply decide not to serve the city. Hey if I have to wear a seatbelt in my car these scooter people should be forced to buy WaveTec and reflective fluorescent GoreTex and elbow and knee pads. Why do they want you to park on the sidewalk if they don’t want you to ride on the sidewalk? Will users get fined if they just use regular street parking? Yes, just like bicycles you’re asked to use the street to travel but it’s illegal to park there. I’m predicting no enforcement of any of these rules because that’s just how Portland operates. People will ride in the bike lanes squeezing out cyclists out of what limited space we already get. They will block sidewalks and bike lanes. People will ride them in parks anyway and no one will stop them. They will swerve around and ride the wrong way. If PBOT tries anything, Uber will throw their weight around until they get what they want. I still do not understand all the love for the scooters coming from cycling advocates. I can only see scooters cannibalizing cycling mode share given how they have a penchant to take over and push out every other mode of transport they show up in (sound’s like another mode of transport people here love to hate). Well, if they can replace car trips, they’re great. If they replace bike / walking trips, then they’re still neutral at worst. I personally haven’t had a lot of trouble with scooters while cycling: there’s room to get around them on greenways, and I’m usually in the lane downtown while they’re on the sidewalk, so no chance to conflict. I do think we should crack down on drunk scootering, because that’s a hazard for the riders as well as other road users, but otherwise, let 1000 scooters bloom. I generally won’t take the lane unless it’s the only option, and prefer riding on a path or bike lane, which are often already not wide enough for the amount of foot and bike traffic they get currently. Adding scooters to the mix that are faster than I am able to ride creates more pressure on the limited amount of space. Plus, I’ve nearly gotten clobbered twice, once on foot and once on my bike. People are often wearing headphones and not paying attention where they are going. Plus, it’s insulting for the the city to continue to not build safe protected bike lanes while forcing more motorized vehicles into them. They keep citing “lack of safe space to ride” as an issue, yet they never do anything to actually build that space. All talk and caving to corporate interests, as usual. You really think the public has any say in what actually goes on in this city and state? No argument there, I do feel like PBOT is pretty much constantly thumbing its nose at anyone with the temerity to want to use a bicycle for transportation. Perhaps the scooter need large highly-visible license plates, so riders on the sidewalks can actually be fined. Otherwise the riders will simply pull away from anyone trying to enforce the laws, and nothing could be done to identify the scofflaw..
PBOT wants them locked to bike racks? The things lock themselves. Just keeping them off sidewalks is not a good enough reason to cede bike parking to them. PBOT, I’ll accept that proposal if you put in more bike corrals in the locations you find scooters parked. And do it quickly. Sorry, but I can’t stop laughing at that picture of the dude on the granny scooter. I think that guy on the sitting scooter could be our answer to congestion and high rents. If we fill the streets with dudes like that riding those things Portland will instantly become so uncool no one will come here anymore, and the tourists will stop visiting so we can go back to the low cost easy living of Old Portland. Portlanders don’t vacation in the gorge. As an ex Hood River/Post Canyon local (minus the MTB ego), I can proudly say I vacation in Portland. Wait, is that a “hipster”?? It’s funny, but it’s probably the only way you’d get my wife on one. People want easy mobility and don’t want to stand the entire time they’re traveling. One reason that some people don’t take transit is fear of not having a seat. How is this new? The definition of an electric scooter has always included a seat. They’re not “allowing” anything new. Still no mention of helmets? I haven’t heard how many people were cited for riding with no helmet. Or if the police were directed to not cite people. This is a really eerie gap in coverage. 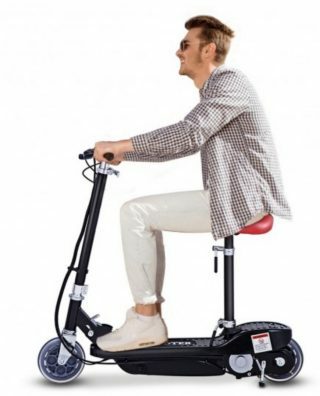 The couple times I thought about riding an e-scooter the only reason I didn’t was because I didn’t have a helmet and didn’t want to be harassed by police. Until the law is changed they can expect a large group of people to never try them due to the helmet requirement. 90% of e-scooter riders do so without helmets. Getting on a scooter is often an impromptu decision and most riders do not lug helmets about with them. This makes the helmet requirement impractical. It would be interesting to know a) how the distribution process worked out, and b) how many citations were issued by PBOT for noncompliance. Also–is the City going to hire people to enforce the rules? Lack of enforcement fosters the negative perception of e-scooters. If we aren’t going to enforce e-scooter rules, then we need to change the laws. The last thing we need are more laws without teeth. I would be all for repealing the helmet requirement for scooters. Let individuals decide what level of risk they are comfortable with, and pay the consequences. hard to know where this goes from here…. seems like we will kiss some of our bike lanes good-bye for useful transportation, especially in the tourist core of Portland in the summer season. Scooters 3-wide in the bike lane, taking selfies and updating instagram in total oblivion, scooter lying all over the ground…. hopefully the extra cash will allow portland to build new bike lanes adjacent to the scooter lanes. But, i expect that lyft/lime/uber/bird will have a lot of strings attached to the cash, and ignore the regulations when it’s convenient, if not always. corporate control of access to the streets is the long game, and this is another step in that direction. I would be okay if scooter riders had some skin in the game for bike lane access (personal ownership, maintenance, year-long use, grass-roots advocacy, etc) but the responsibility-free, instant-gratification aspect of this new mode/fad, along with hyper-analytic money-making corporate profit soul and cookie-cutter device of this new transport idea makes me want to reject the idea of sharing hard-earned bike lanes with these corporate upstarts. I know I’m not alone in this feeling. Does the desire for instant convenience and yet another car-free get-around mode really outstrip the dark side of this issue and the impact to Portland Biking this will bring? Are cyclists really prepared to jump on this band wagon simply because of the siren-song of a car-free set of wheels? I used to see people (alone, groups, families, all ages) in the last round riding scooters on the Willamette Greenway Trail. All looked like they were having fun, and it seemed like a perfect place to ride them. I never felt (or got a sense others felt) that there was any conflict with people biking or walking. I also saw plenty of mixed bike-scooter groups. There’s also now quite a bit of electric skateboard use and ebike use on the trail and other park paths. The scooters seemed to make better sense on the park paths than on streets for most of the people I saw. So as others have said, it is weird to see the program moving forward with two of the biggest (to me anyway) problems–illegality of riding in parks, and the dumb helmet requirement–not corrected. I don’t recall this being mentioned….if scooters were legal on sidewalks and park paths, and become at all popular, that will create a demand for wider sidewalks, smoother surfaces, curb cuts, and lack of obstructions that will benefit pedestrians, especially those needing accessible features (since for the most part, those are also the features that benefit scooter users). That benefit could at least partially offset problems caused by scooter use on sidewalks and park paths, especially over time. If scooters are prohibited from sidewalks and paths, that benefit will never happen. Scooter companies will be encouraged to have their scooters locked to bike racks? A lot of popular spots in the city already don’t have enough bike parking, it’s gonna get a lot worse with scooters taking up near-permanent residence in the bike racks. 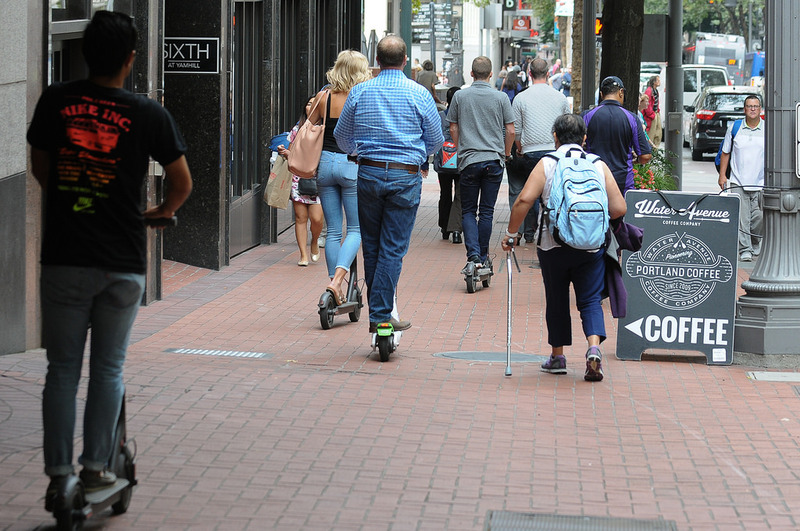 What’s going to prevent most of those 15,000 scooters to be concentrated in the downtown and Pearl district areas? A second pilot program will help find out what new issues will arise. Keep doing pilot programs until the city can come to a final decision. Yes it will work. No it doesn’t work.